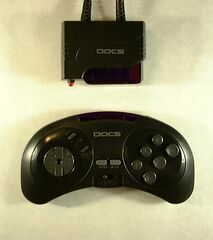 The Wireless Controller is a third-party controller for the Sega Mega Drive and Sega Saturn, created by Doc's. It is a wireless six button controller with both of turbo and slow motion features. It was distributed only as a bundle of two controllers and a receiver. The receiver for the Doc's Wireless Controllers strangely comes in 2 versions. 1st version is similar to the official one and 2nd version has it's own cables. The Doc's also distributed Wireless Controllers for Sega Saturn which look absolutely similar with the exception of a receiver which also has 2 versions: 1st like 1st for Mega Drive but with more rounded shape and 2nd with a cable. In Doc's hardware line up it has 4295 model number. The Wireless Controller shares a similar shell with several Naki products, such as the Action Pad and the Sega Saturn Wireless Pro Controller. There is a Game Partner version created by an unknown distributor.